What you do and how you do it tells people a lot about you. The way you conduct yourself professionally--and personally--tells clients, potential customers, peers, and acquaintances all they need to know about your priorities, values, and overall attitude. With every day and every moment comes the opportunity to brand yourself and build your reputation. Are you squandering that chance or seizing it? This month, I've been helping a friend show an apartment he has for rent. He's in the hospital so I offered to post the ads, take the calls, set the appointments, and show the unit. At the time, I had no idea that would mean fielding a minimum of 20 calls a day and showing the unit 75 times over the course of two weeks. The process has taken over my life, but it's very interesting to have contact with so many different people. Even more interesting to see how many of those folks are incredibly challenged when it comes to basic social skills. People who are interested in the apartment call me outside of the times I said I would accept calls (phoning me at 11:45pm isn't gonna win you any brownie points). I've had several people get short with me because I was unable to show the apartment at the time they initially suggested. Yet, others, just leave vague messages; not identifying themselves or leaving contact info. And, don't even get me started on all the people who are no shows and don't have the courtesy to call me so I don't waste my time waiting. So, what does this have to do with business? Well, it got me to wondering what kind of employees or proprietors these people are. Are some of these problem children as self-involved and unaware in their workplaces? Do they act entitled and demanding in meetings? Are they disrespectful of their supervisor's time and uncaring as to whether they inconvenience their peers or customers? I've met many talented people during this process. Some of the folks work in professional capacities where I might be able to send some potential work their way. 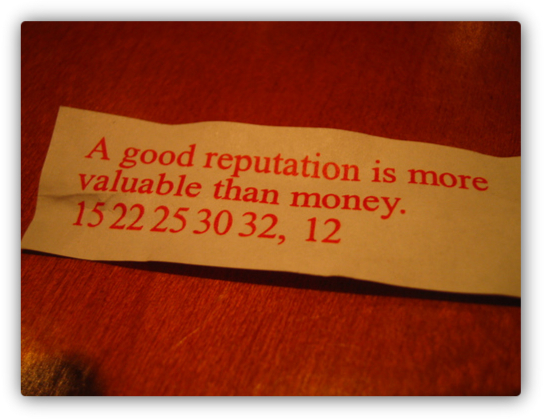 Others are people who would probably benefit from some good word of mouth about their businesses. One guy I was excited about meeting because I had heard of his restaurant and was eager to try it (his assistant set up the appointment with me). However, when the man showed up, he was rude and dismissive to me. Rest assured I won't be patronizing his establishment after that encounter. Remember, in its most basic form, personal branding is about reputation. Who we are is reflected in our daily actions and interactions, whether we think about it or not. How we spend our time, the company we keep, the way we treat others. It all conveys something to those around us. Do you want that impression to be good? Or do you not care? What are you doing to ensure that your personal and professional reputation is the best that it can be? Remember, everything you do is yet another opportunity to outshine the competition! Will you seize that chance or let it slip away? Thanks for chiming in. Maybe it's just me, but I think looking for an apartment is much like job hunting. Put your best foot forward, prove that you're responsible, and show that you're gonna be a drama-free addition to the group. Wow, what an excellent post! You are absolutely right too. One just never knows if the person standing in front of them can change their life! My husband use to own a small delivery service in our city. After he got a little older the freight began to take it's toll and he decided to sell it even though he had no idea what he would go on to do. There was a business he delivered nearly everyday. On the last day he would be delivering there, he ran into the owner that while he had enjoyed delivering product to him from his vendor, he was selling his business. He added that he thought the man had great employees and wanted to thank him and them for making his stops go smoothly. The business owner shook his hand and as my husband turned to get into his truck the business owner stopped him and asked if had ever worked in that type of manufacturing before. My husband said that he had worked in something similar, but no not really. The business owner told him that he really liked my husband and how much energy he put into the job he did and if would be willing to learn how to operate a certain piece of equipment he had, he would like my husband to consider come working for him. How you conduct yourself means EVERYTHING! I have to tell you that like yourself I am sensitive to the way people treat one another ESPECIALLY in business...and being out of work has amplified that sensitivity. I often find myself asking the question "Hmmmm....you treat me like this and I am the one having trouble getting a job?" The same can be said for business owners. I think the issue is multi-faceted. For one thing, we have a generation of people who are being raised on digital "etiquette" but have no F2F social skills. I LOVE Gordon Ramsey but not everyone can or should be him. Because of social media, we have to be HYPER-vigilant because our personal IS our professional and vice-versa. I have way too many stories to share but one that stands out, oddly enough, has to do with a restaurant. This was a very fine steakhouse that I had been dying to go to for the longest time. I finally made a reservation for Easter Sunday. I expected a limited menu, which was no biggie, since most restaurants have limited menus on holidays. When the three of us showed up, my first surprise was that it was buffet style. I was immediately, but only mildly annoyed by this because they should have said that when I made the reservation. Strike 1! We were seated and served our beverages. We made our way up to the buffet and it was SUCH A HUGE DISAPPOINTMENT. I could never imagine I would be disappointed by any buffet, even one I didn't expect. I didn't touch a thing on that buffet...I figured I was not about to pay for 3 meals especially when there was nothing for me to eat....BTW...I am NOT a picky eater...Strike 2! Now here is where it starts to get juicy. We had a waiter who initially seemed fine...until the table of 5 was seated next to us. He never even came back to our table to ask if we wanted a glass of water, after they were seated. But he was incredibly attentive to them. Strike 3! So I ask for the check...keep in mind we are a table of 3. When I look at the check, there is a gratuity included.....I FLIPPED OUT! and asked for the manager immediately and let him have it. The waiter claimed the gratuity was an accident....but even if I did believe him....given everything else...he should have thought twice about presenting that check. Strikes 4-7! Oh wait...I'm not done because neither was the manager. He started off okay by apologizing to us...and when I explained EVERYTHING that was troubling about the visit...he actually offered to give us the entire meal for free....all three of us....but then it went down hill from there for me as a customer. I was most appreciative of his offer...he went into the area where the waiters put in orders and get checks and such, which happened to be in the middle of the dining room enclosed in plexi-glass - a very nice touch but...no privacy. So as he is adjusting the check he is REAMING out the waiter from here to kingdom come in full earshot and eye shot of everyone in the dining room. All diner eyes were on this station and all wait staff eyes were on us. In that moment...I felt bad for the waiter. While he acted inappropriately, everything wrong was not his fault and even if it was...that is still not the appropriate way to handle him. The manager returned and made an offer that we could also come back on another day and have dinner on the house...I told him I would never come back there because his entire wait staff would now be waiting for us instead of on us, due to his display in the middle of the floor. Hmmmm, what you see is what you get with me. I am respectful and considerate of others and treat people like I would want to be treated. I'm also willing to help others in any way I can regardless of their station in life. When I got into this crazy social media world and started to gain some momentum I had people ask "what is your secret sauce"? Guess what? I didn't have one and then much later it kind of dawned on me (nobody has ever accused me of being the sharpest knife in the drawer.........:), it was just me being myself. Plain and simple and I certainly don't say it because I think I'm better or that uniquely different than anyone. But I do have a personality and it is a very positive, upbeat one at that; and I think it serves me well. But having said that, I do think I am unique in my own way (as we all are) and whereas everybody has the same tools and gadgets and can write about exactly the same thing; it's that uniqueness (good or bad) that sets up apart. Well, that's my two cents worth and hopefully I stayed on topic. Folks are always drawn to positive people, indeed! As for treating others the way we'd like to be treated, wouldn't the world be a wonderful place if everyone did that? Wow, that would be incredible. That's a story and a half, Rachel. What an unpleasant way to spend Easter. As for your point about professional being personal and vice versa, I so agree with you. The lines are being blurred more and more everyday. With all the social channels out there, we get to know the people and players more quickly than ever. If we like them, we want to do business with them. If we don't, well, they lost a customer before they even realized we were interested. Everything we do in all aspects of our lives is now subject to quick and easy broadcast to the world. If there was ever a time that all of our reputations needed daily care and watering, this is that moment. Yes! Yes! Yes! That is a PERFECT example of what I'm talking about, Cheri! Yes! Everything we do affects perception. We're being evaluated and opinions are being formed with even the smallest of actions we take or words that we say (or don't!). How we conduct ourselves in all aspects of life is what shapes our reputations. And those reps of ours can cause people to invite us into their worlds and offer opportunities OR put us further away from our goals. Thanks for sharing your story, Cheri. It was a stellar illustration of exactly what I was saying! There are so many situations, like the one you describe, where people seem to de-evolve and forget their social graces. Public transport is my pet peave, people turn into savages. I did an eCommerce site for a friends shop, to get the feel of the business I spent time working in the shop behind the counter, I quickly came to the realization how badly customers treat shop staff but kept my smily composure throughout as that was the nature of their successful business (family orientated and run) & didn't want my reputation damaged by being rude back or challenge their behaviour. If someone has a miserable attitude that spreads like wildfire, far quicker than people who are jolly and amicable, you see that in social media, if a company does something wrong that is all around Twitter in seconds but the good things they do will take much longer. On a personal level you never know who you are going to meet in any day to day situation so being miserable, or unreliable, could cut people off to many opportunities not just business but also personal as well. We have a friend who is a real estate agent in San Jose. She is the bubbliest friendliest person I know, the room lights up when she's around, she will talk to anyone and brighten up their day. She is like this in business and you can't teach skills like this, this is why she is successful. I believe she is a rare person, most people don't think of their reputation in day to day life because they think they might never see those people again, and they don't think they are in a career where they need to worry about reputation. At the university I used to worked at the career advisors will run workshops about personal branding, impression management and so on. It was great to see students use these skills when starting their own businesses, using the uni's start up incubators, and many of them have become incredibly successful. One of them became a millionaire and often comes back to the uni to talk about how he became successful which was basically building his reputation through networking. Education and peer support makes me optimistic of change. Steven, thanks for adding your experiences to the discussion here. "De-evolve", eh? Seems like an appropriate word for a lot of people. Your real estate friend is a great example of what I'm talking about. Her reputation precedes her (in a good way) and I'm sure when people have a need, they think of her first. Regardless of your occupation, I think this new, transparent world in which we live requires everyone to be more aware of their reputations. Because, now, those opinions can be "broadcast" worldwide! For better or worse, people talk freely about those they like, and dislike.